Stacey Lee Webber's imaginative vignette celebrates the diminutive, detailed works of art you might find in your pocket—coins. Using a jeweler's saw, she hand cut reliefs of American bison from Buffalo nickels, reproduced the animal reliefs by casting them in bronze, and arranged them in fanciful herds that showcase the intricate beauty of numismatic art. 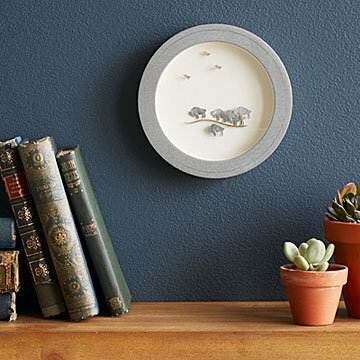 Each element is mounted with a tiny piece of brass tubing to create the illusion of depth—the bison roam a rolling hill that is crafted directly from cut coins. Presented in a circular frame that echoes the form of a coin, each composition is one-of-a-kind because the arrangement of Stacey's prairie pastorals is never the same twice. Handmade in Philadelphia.